Canada's involvement in the Second World War began when Canada declared war on Nazi Germany on September 10, 1939, one week after the United Kingdom. 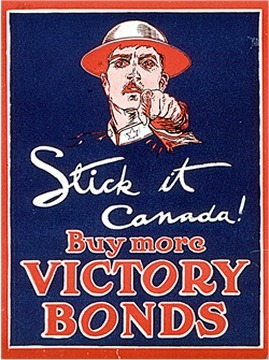 Approximately half of the Canadian war cost was covered by War Savings Certificates and war bonds known as "Victory Bonds" as in World War I. 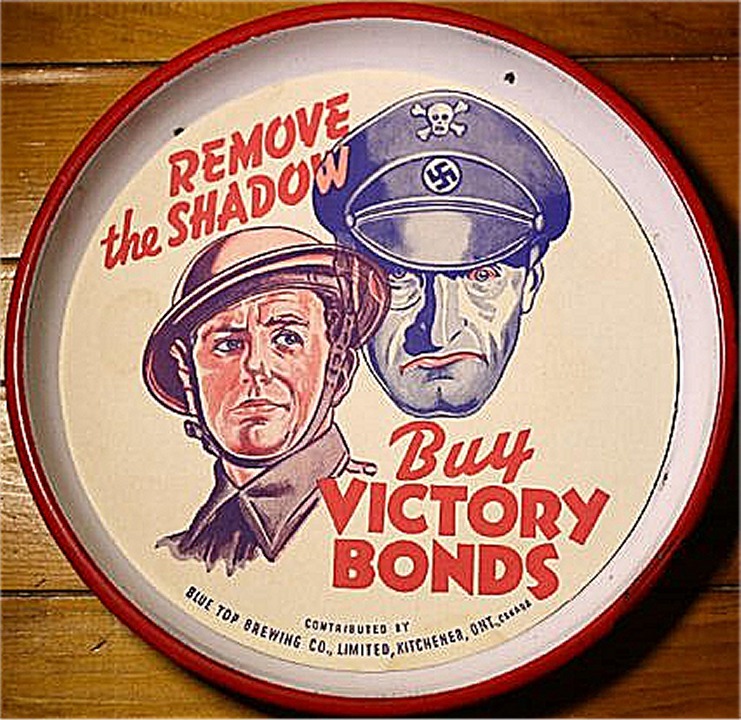 There were ten wartime and one postwar Victory Bond drives. 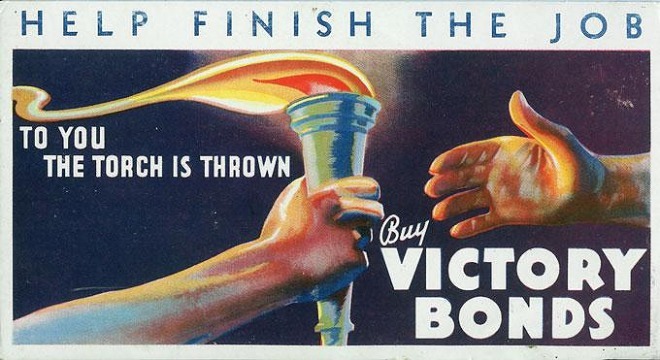 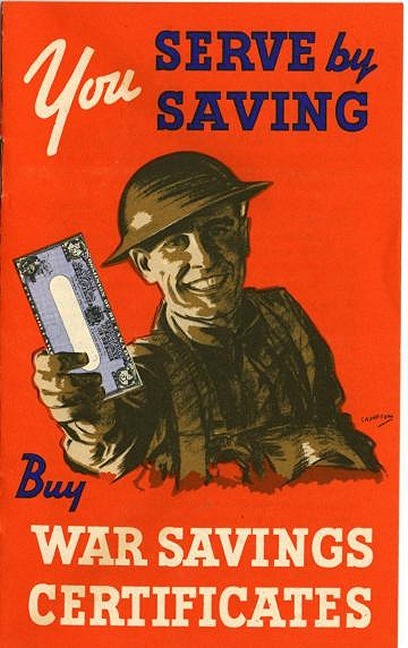 Unlike the War Savings Certificates, there was no purchase limit to Victory Bonds.The bonds were issued with maturities of between six and fourteen years with interest rates ranging from 1.5% for short-term bonds and 3% for long-term bonds and were issued in denominations of between $50 and $100,000. 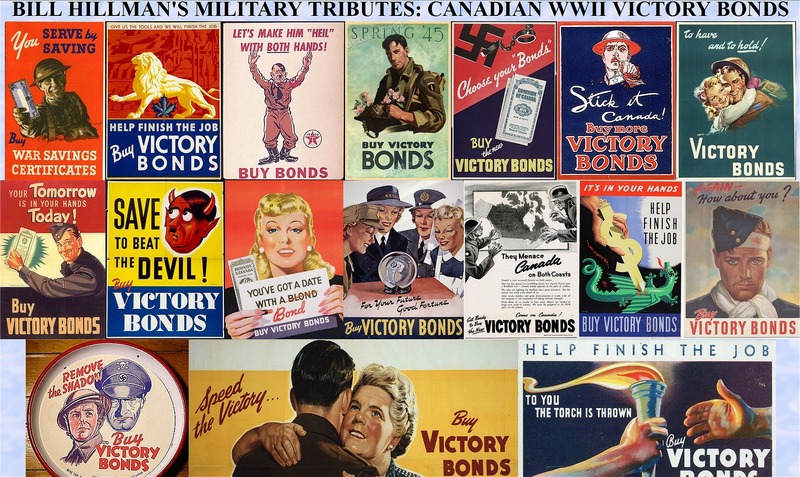 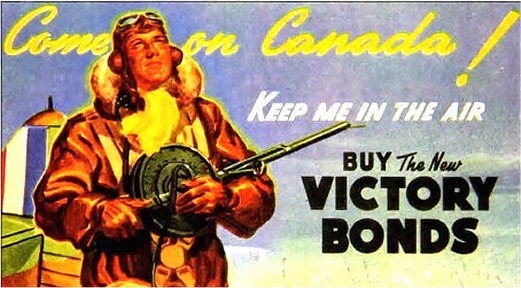 Canadians bought $12.5 billion worth of Victory Bonds or some $550 per capita with businesses accounting for half of all Victory Bond sales. 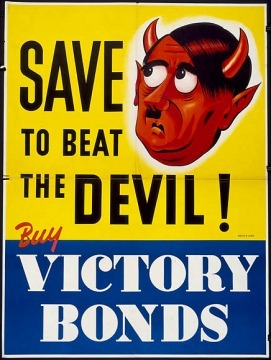 The first Victory Bond issue in February 1940 met its goal of $20 million in less than 48 hours, the second issue in September 1940 reaching its goal of $30 million almost as quickly. 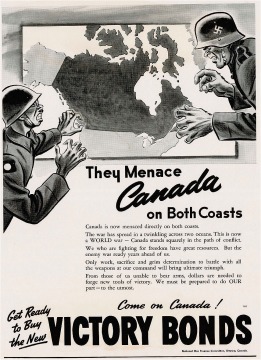 Canadians were physically and psychologically unprepared for war in 1939 - inadequate military preparations were matched by a psychological reticence. 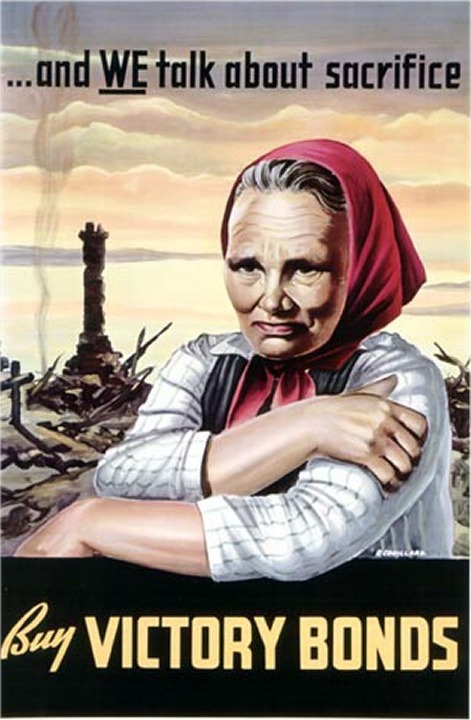 The country had just begun to recover from the trauma of a severe ten-year Depression which had strained the its religious, social and political institutions and bred widespread cynicism and anger. 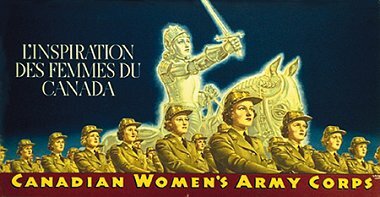 Because of this, Canadians were reticent to assume the responsibilities and sacrifices they knew would be demanded by the war. 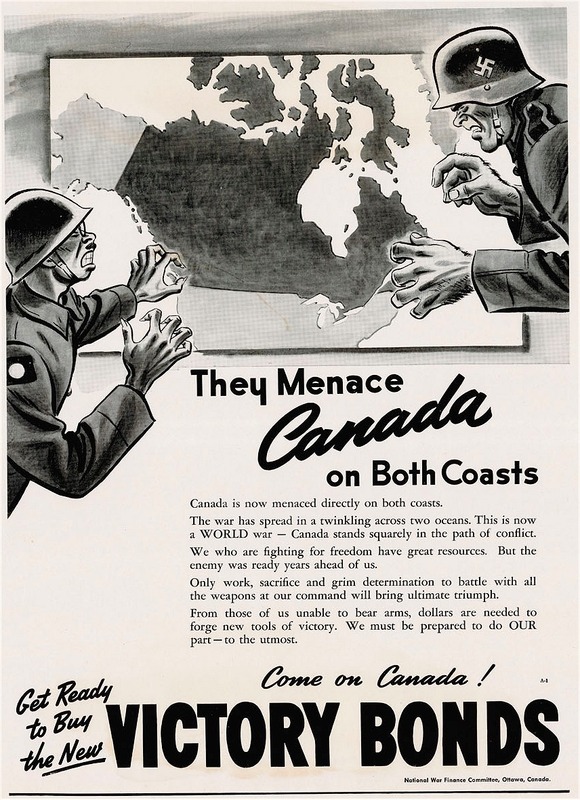 Although they were aware of the deteriorating situation in Europe, many Canadians continued to hope that a full-scale conflict could be averted. 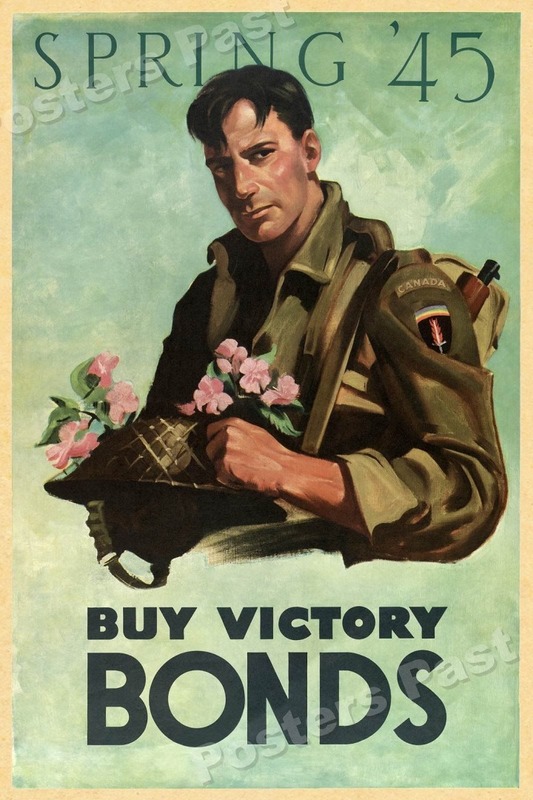 This lack of preparation and enthusiasm, coupled with the nation-wide large-scale sacrifices required of the war made it imperative that the government mobilize public opinion to support the war effort and defuse discontent. 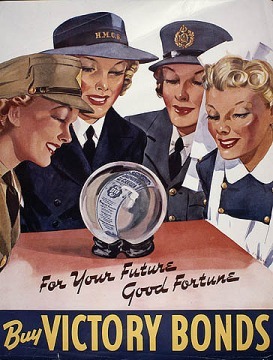 After a shaky and indecisive start, the government, through the Bureau of Public Information and later the Wartime Information Board (WIB), undertook an extensive propaganda campaign "to dampen cynicism" and stimulate support for the war. 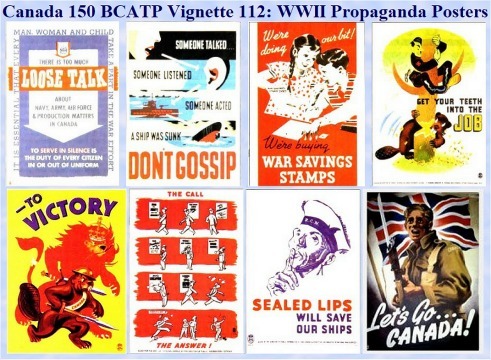 Posters quickly became an essential element in this programme, in part because of their physical properties: they were relatively inexpensive to produce; they could be created, printed and distributed in a relatively short period of time; and they enjoyed a broad, sustained exposure. 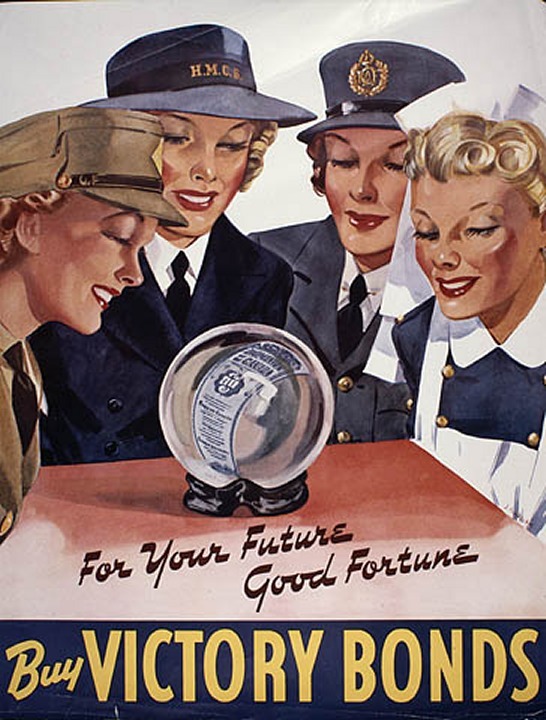 Relying on posters' impact, immediacy, emotional appeal and sustained exposure, federal government ministries and agencies, under the guidance of the WIB, produced approximately 700 propaganda posters that were printed in a wide variety of sizes that appeared on everything from billboards, shop windows and theaters, to buses and streetcars and even matchbox covers. 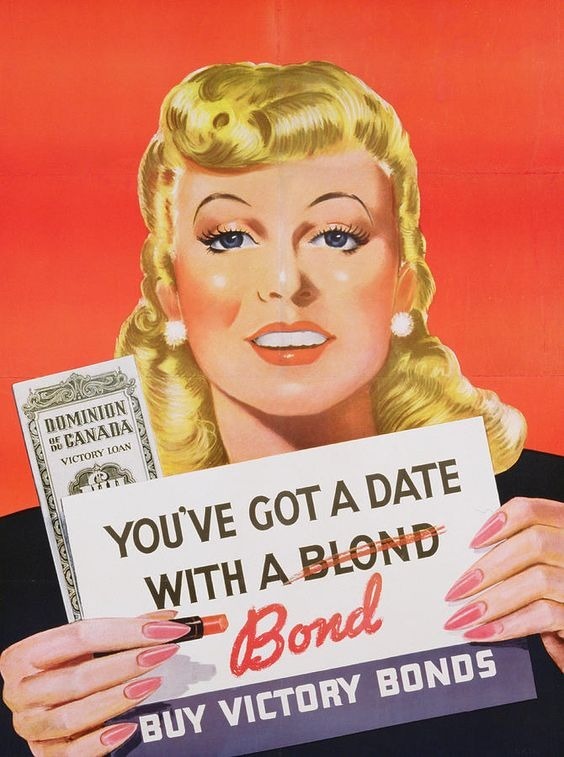 Because of their variety and distribution system, posters saturated the nation's cities and towns, and quickly became familiar to most Canadians. 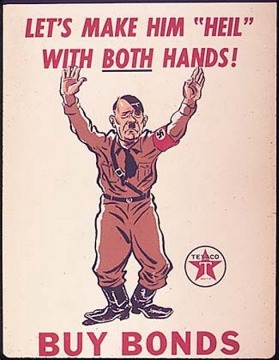 The popularity of posters as a propaganda tool, however, was also a consequence of the manner in which they sent their messages. 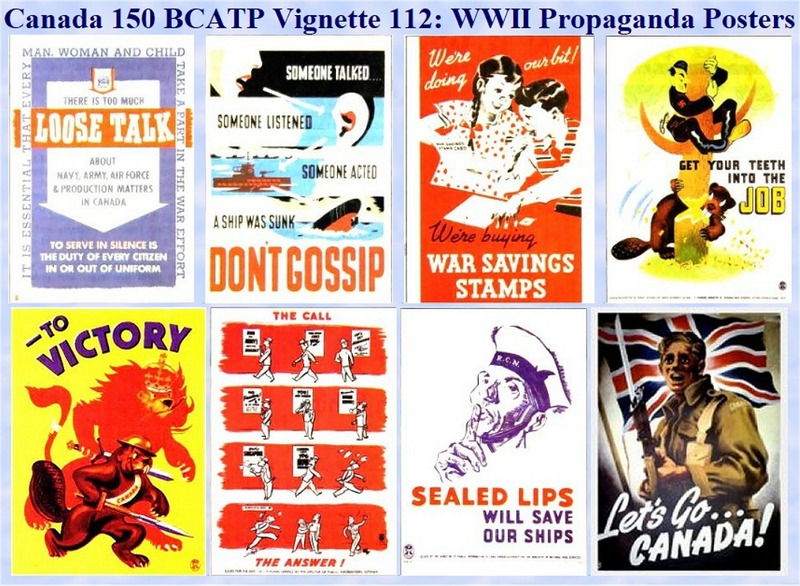 By using images as a form of visual shorthand, they implied much more than was actually stated or shown. 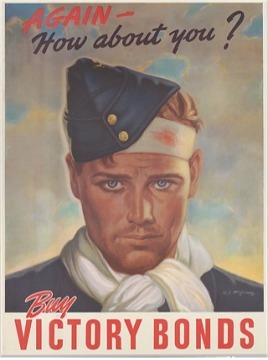 As one of the poster artists pointed out years later, successful posters made this shorthand graphic through "vigorous composition, eloquent colour, an unambiguous theme [and] impassioned execution," and in that way they communicated complex, highly emotional messages "in the blink of an eye." 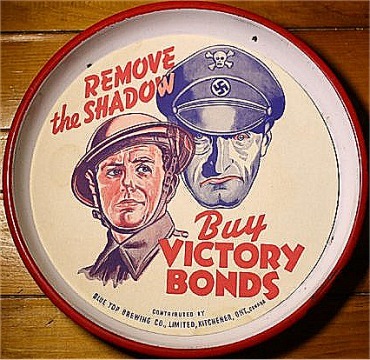 And the powerful messages they transmitted tend to be instantly internalized rather than analyzed. 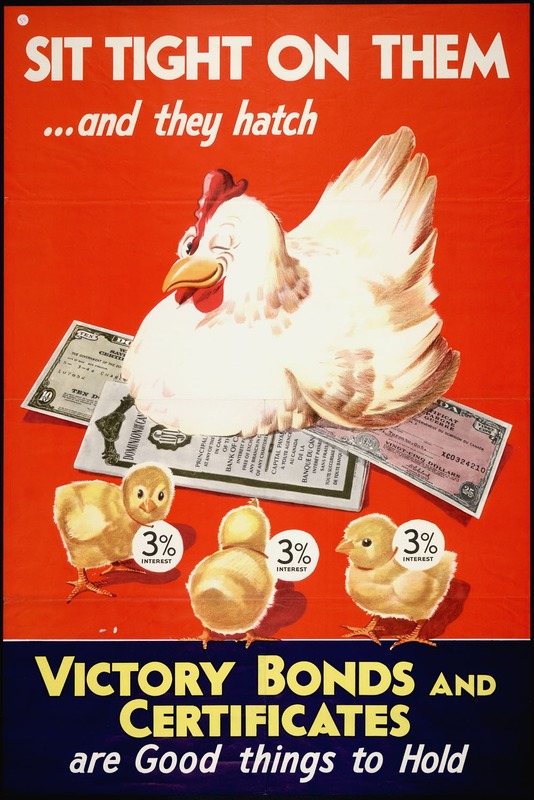 Because of this, the posters had a strikingly immediate impact on people's values, attitudes and aspirations. 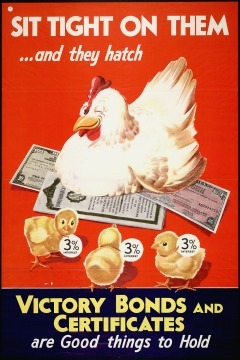 While it is difficult to gauge the impact of these posters, there are a number of indirect measures historians can use. 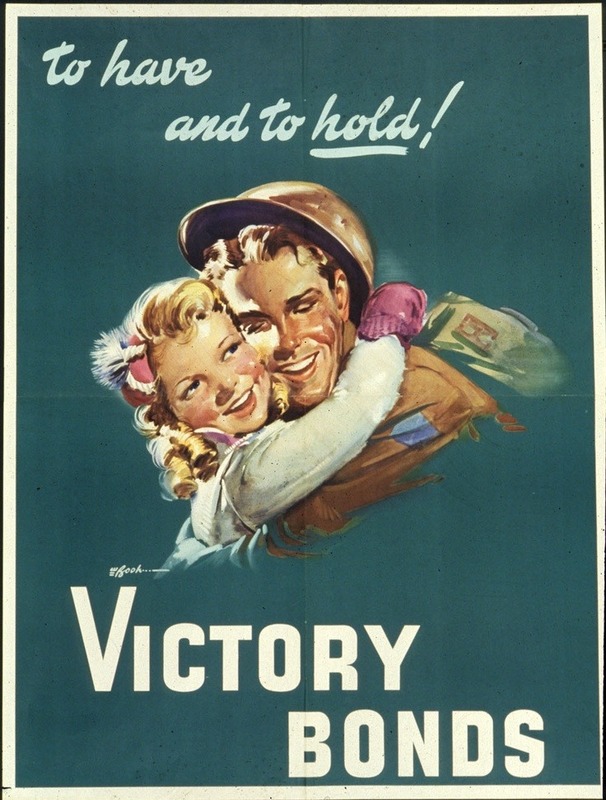 In the first place, the government's campaigns to mobilize support for the war effort--campaigns that relied heavily on posters for propagating their messages--were largely successful. 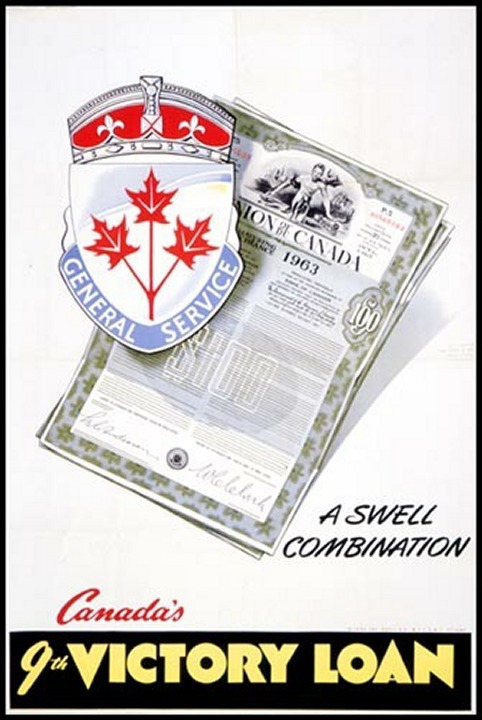 During the war, 1,086,343 men and women performed full-time duty in the three services while 1,239,327 worked in the war industries. Financial contributions were equally impressive: the eleven Victory Bond campaigns raised more than $8,000,000,000 in support of the war. Another indication of the important role posters played comes from the advertising men whose livelihood depended on their understanding of how to reach and persuade people. These men were convinced of the central role posters played in this "war of the mind and spirit" and even toward the end of the war when paper was scarce and production increasingly sparse and uninteresting, they steadfastly refused to mount even a medium-sized campaign without extensive poster support. 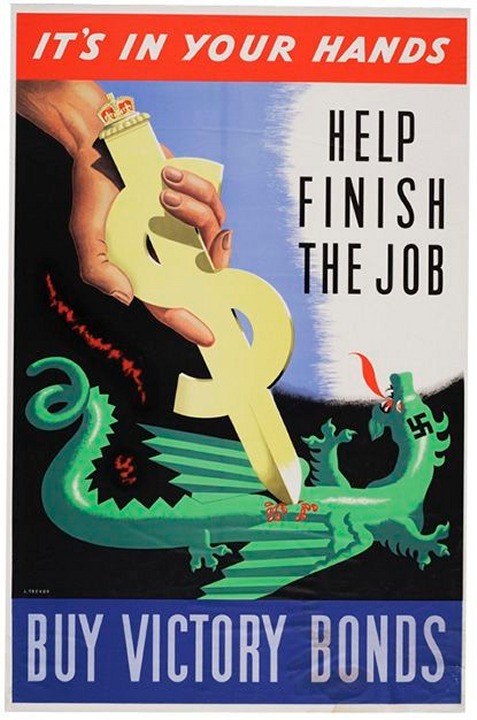 What can historians learn from these posters? 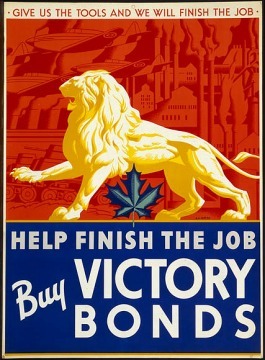 As cultural artifacts, they can provide unique entry points into Canadian society during the war. 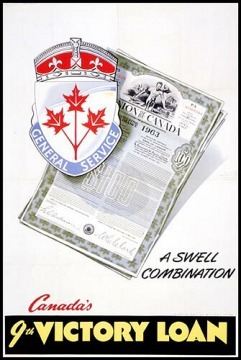 Unlike diaries, newspapers or government records, posters do not purport to record the facts, figures or events of the past. Instead, they provide us with oblique glimpses into the contemporary psychological climate. 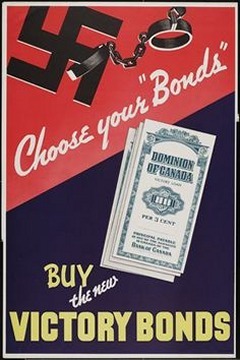 Since the success of each poster depends on tapping into and successfully exploiting commonly-held values and viewpoints, posters reveal preconceptions and attitudes. 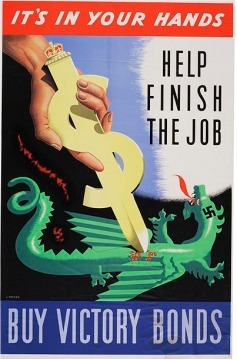 As such, successful posters are invaluable in illuminating the mentalite that prevailed during World War II. 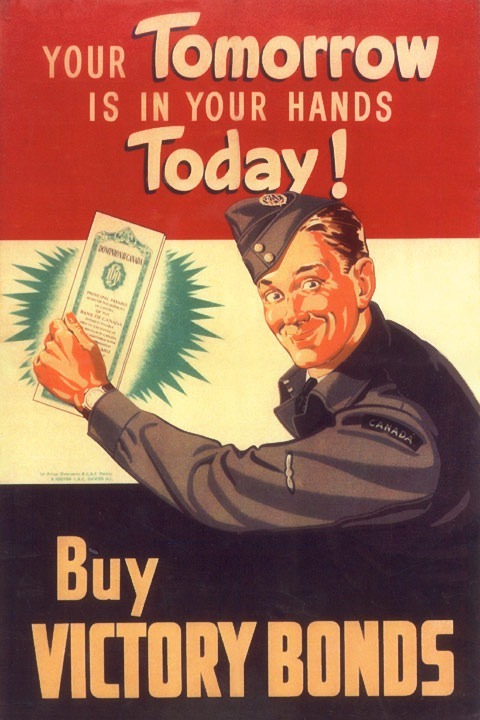 The above posters are very rare and unfortunately they are not for sale.